Looking for a Used XJR in your area? CarGurus has 65 nationwide XJR listings starting at $4,490. Returning to Jaguar's lineup after an absence of 8 years, the XJR roars into 2014 as the performance-oriented version of the automaker's flagship XJ-Series luxury sedans. Riding on a custom-made chassis, equipped with a 550-hp V8 engine and displaying a number of unique exterior styling cues designed to improve aerodynamics and overall performance, the XJR becomes the sportiest Jaguar available today. It joins an XJ-Series lineup that consists of the XJ Base, Portfolio and Supercharged trims. Jaguar offers the XJR in standard and long-wheelbase (LWB) trims for 2014. The standard trim rides on a 119.4-inch wheelbase, while the LWB stretches out on a 123.4-inch wheelbase. Overall lengths measure 201.9 inches and 206.8 inches, respectively. Both trims offer 41.5 inches of legroom in the front, but the LWB offers 44.1 inches of legroom in the rear, compared to the standard wheelbase's 38.9 inches. However, both trims offer the same 15.2 cubic feet of cargo space in the trunk. Although the XJR shares a 5-liter supercharged V8 with the Supercharged trim, it trumps all its siblings when it comes to performance, since the V8 in the XJR delivers 550 hp and 502 lb-ft of torque, compared to 470 hp and 424 lb-ft of torque for the Supercharged trim's V8. As a result, the XJR makes the 0-60 run in just 4.5 seconds, compared to 4.9 seconds for the Supercharged. Jaguar limits top speed for the XJR to 174 mpg. The XJR's V8 mates to the same 8-speed ZF automatic transmission found in the rest of the XJ-Series sedans, although it received unique tuning to ensure quick acceleration and a high level of performance. The transmission automatically adjusts shift points under aggressive driving for a sportier driving experience and includes a manual-shift mode with steering-wheel-mounted paddle shifters. An Intelligent Stop/Start system stops the engine when idling and restarts it again when the driver releases the brake pedal to help conserve fuel. The XJR achieves fuel economy numbers of up to 23 mpg, similar to the Supercharged's numbers of 15 mpg city/23 highway. Outside, the XJR displays a number of signature design elements shared by the automaker's R-designated vehicles, including chrome-rimmed dual air intakes in the lower front fascia, a front air splitter and front hood vents, designed to improve engine cooling and aerodynamics. The gloss black front grille, side rocker sills, side power vents, rear spoiler and quad tailpipes also help provide a distinctive appearance. Unique 20-inch Farallon alloy wheels in either Sparkle Silver or Technical Grey also enhance the XJR's sporty look. Other standard exterior features include HID headlights with self-leveling, LED running lights, heated auto-dimming side mirrors with puddle lights, a power-closing trunk and LED taillights. As expected for an R-designated vehicle, the XJR delivers a dynamic driving experience. Jaguar track-tested the XJR's suspension on racetracks in Germany and England, and tuned the dampers and spring rates to provide optimal sporty handling as well as ride comfort. An Adaptive Dynamics system, which monitors road conditions and driver inputs, continuously adjusts the dampers to ensure a smooth ride. Drivers can select a Dynamic Mode to add firmness to the suspension, while an electronically controlled differential sends extra torque to individual rear wheels as required for good stability in all types of driving situations. In addition, the Dynamic Stability Control (DSC) system includes a Trac DSC setting, which enables drivers the push the vehicle to its limits. The variable-ratio power rack-and-pinion steering system, standard in all XJ-Series trims, has been recalibrated for the XJR to enhance feedback and response. Jaguar also equips the XJR with a sports exhaust system and a high-performance braking system with red brake calipers, adding to the vehicle's visual distinctiveness. Staggered-width 20-inch forged alloy wheels provide plenty of road grip. Inside, the XJR receives a number of unique features, including exclusive heated and cooled 18-way power-adjustable front sport seats embossed with the R logo, metallic foot pedals and an 18-speaker, 825-watt Meridian Surround Sound audio system. Jaguar also brands the R logo into the 3-spoke leather-wrapped steering wheel with audio, cruise and Bluetooth controls. Jet Black leather upholstery with a choice of Ivory, London Tan or Red Zone inserts and contrast stitching, along with a standard Jet Black suede cloth headliner, create an upscale feel. Owners can choose either Carbon Fiber or Piano Black interior veneers and trim. Like its XJ-Series siblings, the XJR includes such standard interior features as a wraparound dash, Phosphur Blue halo lighting and virtual high-contrast TFT instrument gauges, as well as an 8-inch color touchscreen in the upper center console. An auto-dimming rear-view mirror, 4-zone automatic climate control and remote keyless entry are among the other standard features. Options include a 1,300-watt 26-speaker Meridian audio system and a Rear Seat Entertainment system with dual 8-inch LCD screens, a remote control and 2 wireless headphones. The XJR comes standard with such safety features as 6 airbags, DSC with traction control and antilock brakes with electronic brakeforce distribution, brake assist and cornering brake control. Safety options include a blind-spot monitor system. The XJR has not been safety-rated by the IIHS or the NHTSA. 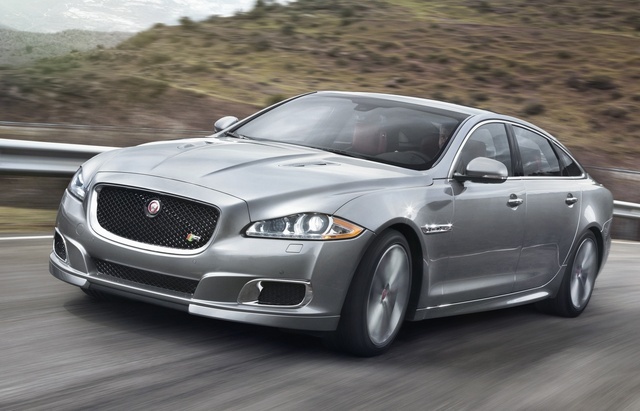 What's your take on the 2014 Jaguar XJR? 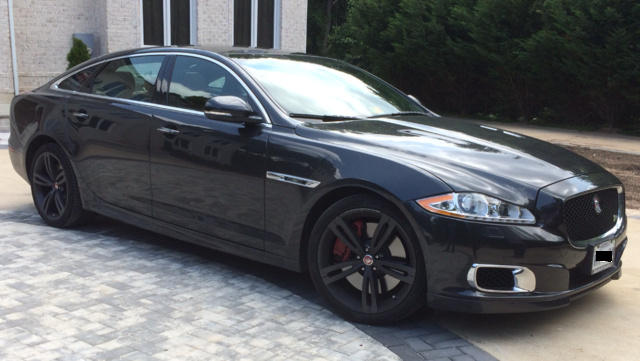 Have you driven a 2014 Jaguar XJR?